Most Americans call Facebook their social media home with 68% managing their own active accounts. A hub to share photos, videos, and news, the urge to overshare becomes too powerful to resist at times. Though counted among the more annoying breaches of online etiquette, the worst that can happen from an oversharing episode isn’t necessarily embarrassment – it could compromise your identity. In addition to Facebook, the average American juggles at least one other online account to help store other sensitive personal data. From financial accounts to medical information storage, keeping track of what’s really out there can easily get away from us. On average, Americans use three different sites containing personal and identifying data. Smart cyber criminals know how to gather pieces of information about us from these multiple platforms, and eventually even gaining access themselves. As many as 35% of adults online have had information like account numbers compromised and another 29% have had someone actually hack into their social media or email accounts. Avoid the trap of magical thinking that guides our thoughts to a “it won’t happen to me” scenario. In 2017 alone, millennials were the top demographic to report losing money to fraud, accounting for 40% of victims. The truth us that everyone is vulnerable and the more we share online, the more we put ourselves at risk. Personal online accounts aside, even a Google search of your own name can show revealing results. Handling over 3.5 billion searches every day, Google acts as something of a virtual crystal ball. Showing results to everyone from potential future employers to cyber criminals alike, what you can see when you search your own name is likely what everyone else can see as well. 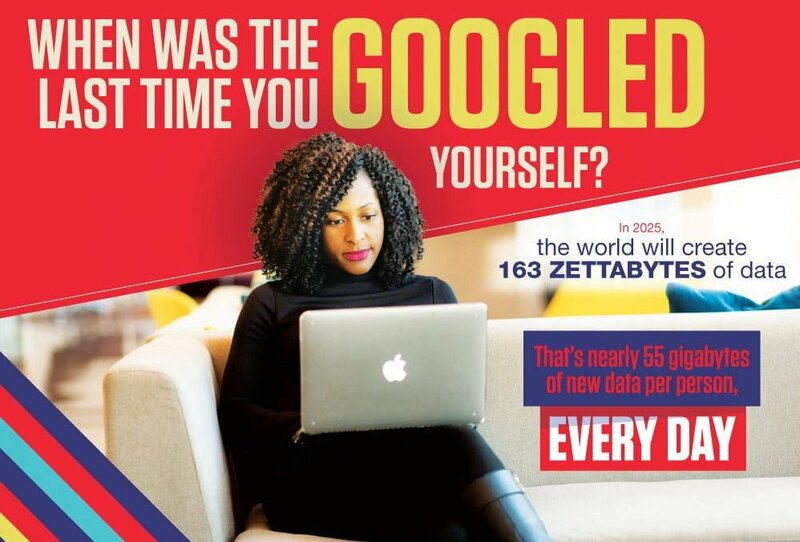 More than half of millennials have searched their own name on Google at least once, and over one in then Gen Zers do so on a daily basis. For cyber criminals and scammers, a Google search is often a jumping off point when it comes to accumulating information on a certain victim. Garnering everything from Facebook profiles to usernames, assembled information can build a highly exploitable and personalized attack. Using a mixture of digital knowhow and social engineering, targeted email phishing scams can hit us right where it hurts, preying on our insecurities. Ready to take control of your online presence? Detailed in this infographic is all you need to know about online data safety from Facebook security settings to Google search results.